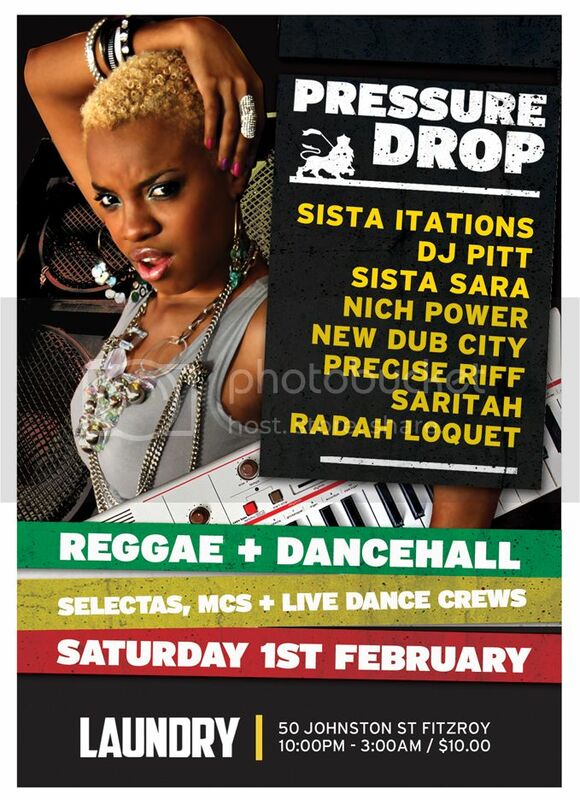 Pressure Drop is back for 2014, bringing in the reggae-dancehall styles at Laundry upstairs. And we'll be kicking off the summer vibes with a killer line-up of selectas and live MCs! Sista Itations will be joined by guest selectors DJ Pitt (Pull Up Selector); Sista Sarah (Mash It Up) and original Pressure Drop resident Nich Power. Resident lyrisist Precise Riff will be running the mic, alongside the soulful songstress Saritah. Plus a special debut from the all-female MC trio, Radah Loquet. And if all that wasn't enough, New Dub City are also making a welcome return with a special live set showcase! Vibes kick off at 10pm, $10 entry, and good vibes guaranteed!